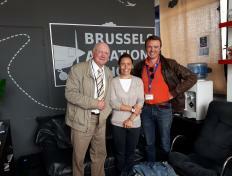 Vanina passed her PPL skill test with Philippe Lemmens today. Vanina was on board of the OO-JET. She started her flight training in June 2017 and mainly flew with Alexandre, André, Cédric, Frédéric J. and Julien. Vanina is only the 6th female student of the school who qualifies as a private pilot since the school was created in 2007. You are a champion Vanina, congratulations! !